The use of telemedicine is growing, but its efficacy for achieving comparable or improved clinical outcomes has not been established in many medical specialties. The objective of this systematic review was to evaluate the efficacy of telemedicine interventions for health outcomes in two classes of application: home-based and office/hospital-based. Data sources for the study included deports of studies from the MEDLINE, EMBASE, CINAHL, and HealthSTAR databases; searching of bibliographies of review and other articles; and consultation of printed resources as well as investigators in the field. We included studies that were relevant to at least one of the two classes of telemedicine and addressed the assessment of efficacy for clinical outcomes with data of reported results. We excluded studies where the service did not historically require face-to-face encounters (e.g., radiology or pathology diagnosis). All included articles were abstracted and graded for quality and direction of the evidence. A total of 25 articles met inclusion criteria and were assessed. The strongest evidence for the efficacy of telemedicine in clinical outcomes comes from home-based telemedicine in the areas of chronic disease management, hypertension, and AIDS. The value of home glucose monitoring in diabetes mellitus is conflicting. There is also reasonable evidence that telemedicine is comparable to face-to-face care in emergency medicine and is beneficial in surgical and neonatal intensive care units as well as patient transfer in neurosurgery. Despite the widespread use of telemedicine in virtually all major areas of health care, evidence concerning the benefits of its use exists in only a small number of them. Further randomized controlled trials must be done to determine where its use is most effective. There are over 450 telemedicine programs worldwide, with over 360 of those in the United States . There are programs in virtually every medical specialty, and the populations they most commonly serve include those who live in rural areas, the elderly, and veterans. With the growing ability of modern computer and communications technology to capture and quickly transmit textual, audio, and video information, many have advocated its use to improve the health care provided to individuals in rural areas, in the home, and in other places where medical personnel are not readily available. Many believe that the growth of telemedicine is impeded by reimbursement policies of the federal government and private insurers [2, 3]. These authors claim this leads to a vicious cycle: There is a growing call for telemedicine services to be covered as part of health insurance. Health care payors, whether governmental or private, have been reluctant to do so. This, in turn, has led telemedicine advocates to blame payors for impeding development of the technology. One reason for the lack of coverage of telemedicine has been an uncertainty about its efficacy and cost. There have been a number of previous systematic reviews assessing the efficacy of telemedicine and related technologies [4–9]. All of these studies noted that although the technology showed promise in certain areas, the overall methodologic quality of the evaluative studies was low and the plan for the most appropriate and cost-effective use of telemedicine was unclear. This systematic review had its origins in a report commissioned by the US Health Care Financing Agency (HCFA) and the Agency for Healthcare Research and Quality (AHRQ) to assess the efficacy of telemedicine in the adult, non-pregnant population . A subsequent supplemental report extended the analysis to the pediatric and obstetric population . The goal of this paper is to assess whether telemedicine interventions result in comparable health outcomes to in-person care. It merges results from the original two reports and updating them with studies published since the reports were submitted to the federal agencies. We broadly divide telemedicine into two general areas. In office/hospital-based telemedicine, both the patient and clinician are in a professional health care setting, such as a practitioner's office or in the hospital. There is a subcategory of office/hospital-based telemedicine called store-and-forward telemedicine, where clinical data is collected and forwarded for review later in a completely asynchronous manner, but it was not assessed in this systematic review because our literature review failed to identify any studies of clinical outcomes utilizing it. In home-based telemedicine, the patient is at his or her residence, with direct communication between the clinician and the patient or their caregiver. The criteria for study inclusion in this systematic review were that the study be relevant to at least one of the areas of telemedicine and contain data on outcomes of clinical care that compared telemedicine with a control group of in-person care. We excluded services that would not normally require face-to-face encounters between the clinician and patient (e.g., radiology and pathology diagnosis), used only telephone care or electronic mail, or provided medical advice directly to the public. 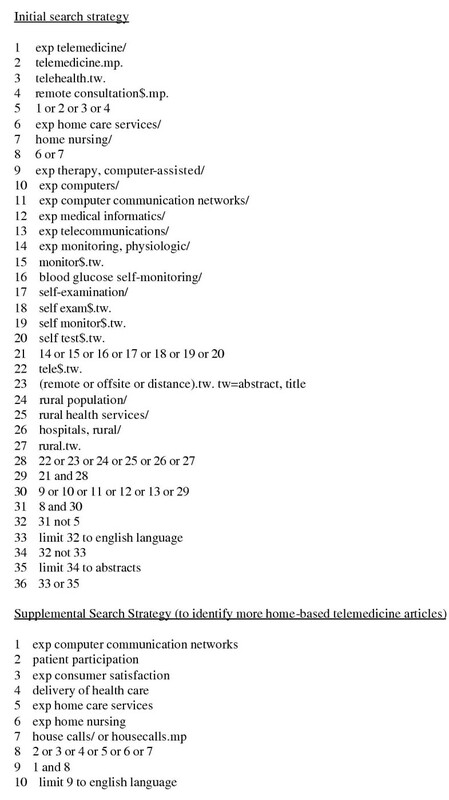 We developed a search strategy designed to find any publications about telemedicine and used it to search MEDLINE, EMBASE, CINAHL, and HealthSTAR through February, 2001 (see Figure 1). We also searched through telemedicine reports and compilations such as the Conseil d'Evaluation des Technologies de la Sante du Quebec, the Telemedicine Strategic Healthcare Group Report, the International Society for Telemedicine Conference Proceedings, the Association of Telemedicine Service Providers' database , and the Telemedicine Sourcebook 1998. We also assessed three systematic reviews (different in scope from this study) from the International Network of Agencies for Health Technology (INHATA) , the Cochrane Database of Systematic Reviews , and the Agenda d'Avaluacio de Technologia Medica . In addition, we identified additional articles from the reference lists of included reports and articles and also contacted known telemedicine experts to find additional articles to identify and describe telemedicine programs. Finally, we also handsearched all issues of the two major telemedicine journals, Journal of Telemedicine and Telecare and Telemedicine Journal (recently renamed Telemedicine Journal and e-Health), through the end of 2000. Search strategies. Search strategies for MEDLINE shown; comparable strategies were used for EMBASE, CINAHL, and HealthSTAR. Each title/abstract retrieved was reviewed by two reviewers. When the two reviewers disagreed, a third reviewer made the final decision. We retrieved the full-text articles for citations selected for possible inclusion in the systematic review. When an article met the criteria for inclusion, the summary statistics were extracted. To evaluate the quality of the studies assessed, we adapted a scale developed by our evidence-based practice center (Table 1) . We used a second scale to indicate the direction of the evidence (Table 2). Classification of evidence for studies of clinical outcomes of telemedicine interventions. Literature searching in MEDLINE, CINAHL, EMBASE, and HealthSTAR yielded 4,628 possibly relevant references. Additional studies were identified from previous systematic reviews, reference lists of included papers, and handsearching of the two peer-reviewed telemedicine publications. Applying the inclusion criteria yielded 19 articles in home-based telemedicine (Table 3) and six in interactive office/hospital-based telemedicine (Table 4). Studies of clinical outcomes using interventions of home-based telemedicine. Studies of clinical outcomes using interventions of office/hospital-based telemedicine. Decreases in severity-adjusted ICU mortality (46–68%) and hospital mortality (30–33%). Decreases in ICU complications (44–50%) and ICU length of stay (30–34%). The overall methodologic quality of many of the studies was low. Only eight home-based telemedicine studies and one office/hospital-based telemedicine studies met the criteria for class I studies. Some of the problems included small sample sizes, short duration periods for the interventions, and lack of follow-up after the initial episode of care. For this reason, as well as the general heterogeneous nature of the studies, no attempt at aggregation (i.e., meta-analysis) was performed. By far the most common area that has been studied in home-based telemedicine is monitoring of blood sugar in patients with diabetes mellitus, with a total of eight studies. The next most common areas have included general chronic disease management (three studies), hypertension (two studies), and AIDS (two studies). The studies that have assessed home monitoring of diabetes have focused on tracking insulin dosages and used Hemoglobin A 1C as an outcome measure. Two of the studies identified focused on gestational diabetes, one on children, and the remainder on adults. Only one diabetes study was adequately designed to rate as a class I randomized controlled trial (RCT) . This pediatric study showed no difference in glycemic control between groups (HgbA1C for both groups actually rose), emergency room visits, psychological status, and family functioning. The two largest studies of adults showed that both the experimental and control groups improved, with no statistically significant difference between them [17, 18]. Three other studies demonstrated a small but statistically significant benefit in HgbA1C [19–21]. Both studies of home gestational diabetes monitoring found improvements in blood sugar values but not in HgbA1C, although each had very small sample sizes and probable inadequate statistical power to detect a difference [22, 23]. Three studies addressed general chronic disease management. The largest and best-designed was an RCT where both the intervention and control groups were provided usual home health care but the intervention group also received a video system that allowed real-time remote interaction with the health system . Both groups had comparable compliance with medication regimen, knowledge about their disease, ability to move toward self-care, and scores on the 12-item Short-Form Health Survey (SF-12)™. The other studies described the use of videophones for patient communication with health care providers. In a study in Japan, 16 elderly patients who were provided with videophones were compared to 16 matched patients who used regular home health services . After 3 months, the videophone group significantly exceeded the control group in activities of daily living, communications, and social cognition, as measured with the Functional Independence Measure. The videophone intervention was a supplement to (not a substitute for) regular home health services. The second study, a qualitative report of 12 cases, showed a reduction in the number of home-care visits needed for seven of the patients . Of the two studies of monitoring hypertension via home-based telemedicine, one looked at the elderly while the other looked at pregnant women. The study of the elderly was an RCT that assessed the effect of a computer-controlled, automated telephone system versus usual office-based care on adherence and blood pressure control in older hypertensive patients . Mean antihypertensive medication adherence improved 17.7 percent for telephone system users versus 11.7 percent for controls. Mean diastolic blood pressure decreased 5.2 mm Hg in users compared to a 0.8 mm Hg drop in controls, a statistically significant difference. There was also a positive relationship between medication adherence and blood pressure reduction. The study of hypertension in pregnant women found that an at-home blood pressure monitoring system resulted in comparable levels of blood pressure, anxiety, and gestational age of delivery as hospital-based monitoring . Two studies of persons with AIDS demonstrated the value of a home computer link to information, others with the disease, and a health care professional who could steer the patient to advice. One of the studies showed the system reduced social isolation after controlling for depression as well as improved decision-making confidence . The other demonstrated various quality-of-life improvements as well as fewer and shorter hospitalizations . An RCT of a home computer link for caregivers of patients with Alzheimer's Disease found improved decision-making confidence . An RCT of an Internet-based telemedicine program for families of children in a neonatal intensive care unit found that among infants born with weight of <1,000 grams, there was a trend towards shorter hospital stays . A study of videophones for pediatric home ventilator patients found that the number of unscheduled hospital visits and hospital admission days was reduced significantly compared with historical controls . Of the two RCTs identified, one assessed outcomes in patients entering an emergency department who were randomized to in-person or telemedicine care . There were no differences in the need for additional fellow-up care or return to the emergency room (ER), showing that telemedicine was as effective as regular care in this setting. Another RCT assessed "clinical outcome," which was defined as the need to have a follow-up appointment with a hospital-based specialist . Interactive teledermatology consultation (46 percent) was found to have the same rate of need for follow-up care as in-person consultation (45 percent). No statistical analysis of the differences was performed. A time series cohort study demonstrated reduced mortality, complications, and length of stay in a community hospital surgical intensive care unit (ICU) with continuous intensivist oversight via telemedicine . A study in a neonatal ICU used a retrospective comparison to show reduced length of stay with the use of a telecardiology system . Two studies of neurosurgery patients demonstrated benefit of transmission of radio logic studies to avert complications in patient transfer [40, 41]. Despite the widespread use of telemedicine in virtually all areas of health care delivery, there is only a small amount of evidence that interventions provided by telemedicine result in clinical outcomes are comparable to or better than face-to-face care. The best evidence comes from home-based telemedicine, where modest benefits have been shown for patients with chronic disease, AIDS, and Alzheimer's Disease. The most studied area in home-based telemedicine is monitoring of blood sugar in patients with diabetes mellitus. The benefits are not conclusive, with studies showing no change or a slight drop in HgbA1C levels. In office/hospital-based telemedicine, there is good evidence that telemedicine interventions provide comparable care in the ER settings and benefit in the surgical and neonatal ICU settings. There is also probable benefit in its use prior to transfer of neurosurgery patients. Although there is good evidence for the diagnostic capability of teledermatology , the only assessment of its outcomes has focused on the need for specialty follow-up. Further studies must be done to demonstrate the efficacy of telemedicine for diagnostic and management decisions. Large-scale RCTs must be done to identify the health outcomes whose benefit appears most promising. If the goal is to show comparability to usual care, then studies must provide adequate statistical power to show that the lack of a difference truly exists. Small studies with inadequate power are not good evidence. The fact that telemedicine is an emerging technology is not a reason for failing to perform appropriate evaluation studies. Rather, new methodologies such as "tracker trials" should be used to assess it systematically . Tracker trials are designed to assess new and/or rapidly changing interventions and compare efficacy not only of the general intervention but also specific instances of it, such as a newly-developed approach that has become available after the general trial started. We would also advocate that journal editors exhibit restraint when considering publication of low-quality evaluation studies. As such studies often accompany otherwise appropriate descriptions of telemedicine systems, they should consider refusing to publish the portion of the article containing the low-quality evaluation study and publish the rest. The growth of high-speed telecommunications networks and their ability to transmit higher-quality imaging and other clinical information indicates a bright future for telemedicine, especially as the infrastructure is built out to reach to individuals who have historically been denied high-quality health care due to their remote location. As the cost of these services will challenge the health care budgets of even well-to-do nations, it is imperative that decisions to use them be based on appropriate evidence that they lead to comparable patient outcomes in office/hospital-based telemedicine and improved patient outcomes in home-based telemedicine. The authors of this article are responsible for its contents, including any clinical or treatment recommendations. No statement in this article should be construed as an official position of the Agency for Healthcare Research and Quality or the U.S. Department of Health and Human Services. This study was conducted by the OHSU Evidence-based Practice Center under Agency for Healthcare Research and Quality contract 290-97-0018, task order no. 3, Rockville, MD.